ACCULAS ® is a light modeling system that enables the processing of three-dimensional structure in the world's first order of microns. Complex three-dimensional shape fine structure is also micro-machining system can be manufactured in a short period of time and a simple operation. This revolutionizes 3D microfabrication in combination with a dedicated light-curable resin which is prepared to specifically. And prototyping and production of micro devices bio-medical (micro systems, micro-machine), and optical and electronic MEMS, such as the production of electricity master mold of nanoimprint and micro-film surface processing, you can take advantage of. The ACCULAS ® Corporation and Laser Solutions JSR (Ltd.) was born in joint development of. Co., Ltd. D-MEC is responsible for marketing and technical development. Optical modeling system of micro-region to be the world's first completed at last! The cured by ultra-precision resolution by high-precision digital exposure mechanism, a photo-curable resin having a special resolution. Three-dimensional shape is formed with a layered manufacturing method. To produce a three-dimensional microstructures exposure the coating of resin is repeated automatically. 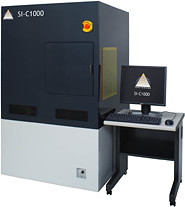 It is expected to be utilized for research, prototyping and manufacturing of three-dimensional shape of the device micron order that demand will increase rapidly in the future. As applications, micro-device field (medical and biotechnology, optical and electronic, information and communication, environment and energy), such as micro-components sector micro gear, such as a micro connector, MEMS, light guide plate and diffusion plate, and a micro lens array I am beginning to be used in the study, such as electroforming mold master application fields of micro molding film surface processing areas, such as nano-imprint. And they are responsible as well as micro-device joint development with customers in D-MEC. Please contact us feel free. According to ACCULAS ®, D-MEC has also undertake micro-machining contract business.Request a quote, we have up consultation, etc. wait monkey.